are the experts for ceiling fan installation and are the authorized factory warranty repair center for Casablanca, Concord, Emerson, Fanimation, Minka, Monte Carlo, Regency & more. 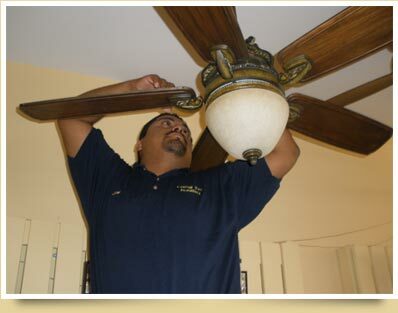 Jose installed 7 ceiling fans for us last year. We were so happy with his quality work that we had him install another this summer in the baby's room. Thank you, Jose for making things easy for me. Whenever I need a fan for one of my tenants, I just call you. My neighbor is a good handyman so I had him hang the fan we bought. When it made noise and wobbled, I called him for help. After several futile attempts by my handyman neighbor, I called you. Within 10 minutes of your arriving at our house, you fixed the problem. No more handyman fan installs here. Thank you. My husband and I have enjoyed the comfort and money saving aspects of ceiling fans for many years in our various Las Vegas homes. My husband is a retired electrician and always insisted on installing the fans himself. He is 77 years old now and I was so pleased that the Fanco store recommended you because he was going to install the 2 ceiling fans that we bought at Fanco. The "buy one get one free installation" promotion that your company had with Fanco was enough to convince him that he should use your services. Thank you so much. Lighting and Fan Installers made our new home into our dream home by installing a beautiful 8 foot crystal chandelier. Thank You! Assembling ceiling fans or lights and wiring the new fixture to an existing electrical box that has power and is sufficiently reinforced to support the weight of the new fixture.